How many snowflakes does it take to build a snowman? Snow has a lot in common with religion. It comes from heaven. It changes everything. It creates an alternative reality and brings on irrational behaviour in humans. But unlike most religions, snow has never had a bible, until now. 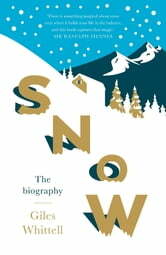 Giles Whittell, a passionate snow enthusiast, takes the reader on a quest through centuries and continents to reveal the wonders of snow. Along the way he uncovers the mysteries of snow crystal morphology, why avalanches happen, how snow saved a British prime minister’s life, and the terrifying truth about the opening ceremony of the 1960 winter Olympics. Snow is the next best thing to a white Christmas, an anthropology and travelogue for everyone from ski addicts to the millions of people who have never even seen it.